General Hospital (GH) spoilers for Monday, January 8, tease that Maxie (Kristen Storms) will still be freaking out over Dr. Obrecht’s (Kathleen Gati) confession. She reassured Nathan (Ryan Paevey), but she’s worried deep down. Maxie will open up to Lulu (Emme Rylan) about her Faison (Anders Hove) fears. She’ll wonder what’ll happen if her baby carries this villain’s twisted genes. 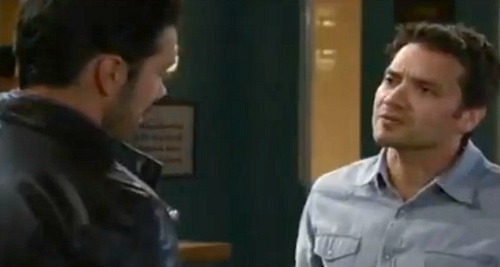 While Lulu attempts to calm Maxie, Nathan will confide in Dante (Dominic Zamprogna). He’ll admit that Faison’s his father, so Dante will try to help him deal with that revelation. Unfortunately, nothing can truly calm Nathan at this point. He needs time to process what this means for his family. Across town, Anna (Finola Hughes) will get some stunning news. Sonny (Maurice Benard) and Jason (Steve Burton) will fill Anna in on the new manuscript hints. They’ll suggest that the author is Faison’s son, so Anna will hope to figure out who that might be. All the clues line up with Peter (Wes Ramsey), but it’ll take some work for these three to reach that conclusion. It looks like Anna will also have a deep conversation with Finn (Michael Easton) on Monday. He’ll insist on telling the truth, which may involve pouring his heart out. Finn’s feelings for Anna are growing, so he might want to spell it out and make sure she knows where he stands. Other General Hospital spoilers say Drew (Billy Miller) and Sam’s (Kelly Monaco) plan will hit a snag. Sam wants to get married right away, but Drew will note that they have a problem. They’ll find out Sam’s still legally married to Jason, so they’ll need a divorce before they can officially tie the knot. Sam will promise Drew that this doesn’t change anything, but more doubts could creep in soon enough. Elsewhere, Carly (Laura Wright) will worry that Josslyn’s (Eden McCoy) growing up too fast. She may be concerned about the speed of Josslyn and Oscar’s (Garren Stitt) romance. Oscar will have something he wants to talk to Joss about in Monday’s GH episode. Whatever it is could bring them much closer. Carly will certainly be keeping an eye on these two as their love story develops. It sounds like several storylines are heating up. Are you anxious to see where all the action leads? We’ll give you updates as other General Hospital details emerge. Stay tuned to ABC’s GH and don’t forget to check CDL often for the latest General Hospital spoilers, updates and news.